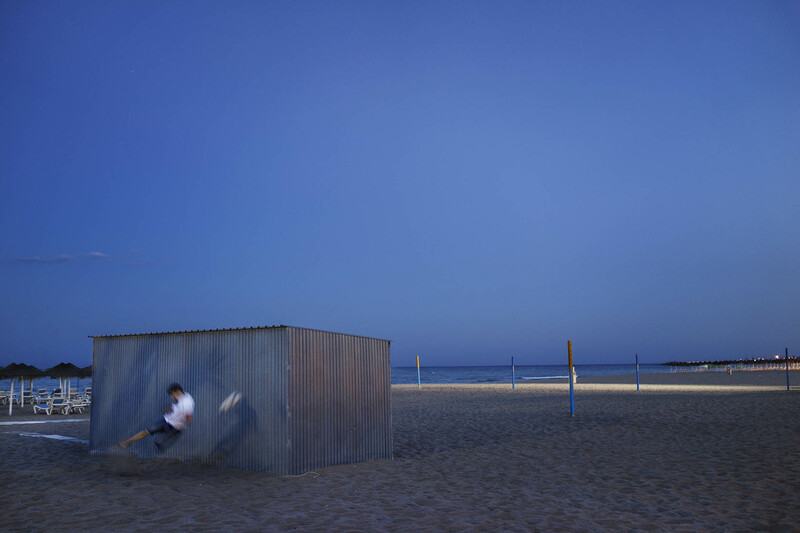 Spain Fuengirola Torreblanca Local boys playing football on the beach in Torreblanca (Fuengirola) using a storage barracks as goal. The long broad beach streatching from Fuengirola is crowed by tourists during the summer months. But in the mornings and late eveings, the sun hungry tourists leave the beaches to the locals. In 2013, Costa del Sol as a whole received 9.5 million tourists, a large number of them from the UK. Of the approximately 72,000 permanent inhabitants registered in the municipality, 25% come from other countries, mainly European such as England, Ireland, Scotland, Finland and Sweden. Fuengirola is one of three mega-resorts which occupy this stretch of the Spanish coastline. Fuengirola runs for around 10km along the coast. Many accounts of these resorts refer to them as ‘former fishing villages’ but due to the intensive developments of hotels and apartments which have been going on for a long time, almost nothing remains of the former villages. In spite of the resulting ‘concrete jungle’ the resort is extremely popular with tens of thousands of visitors returning year after year.